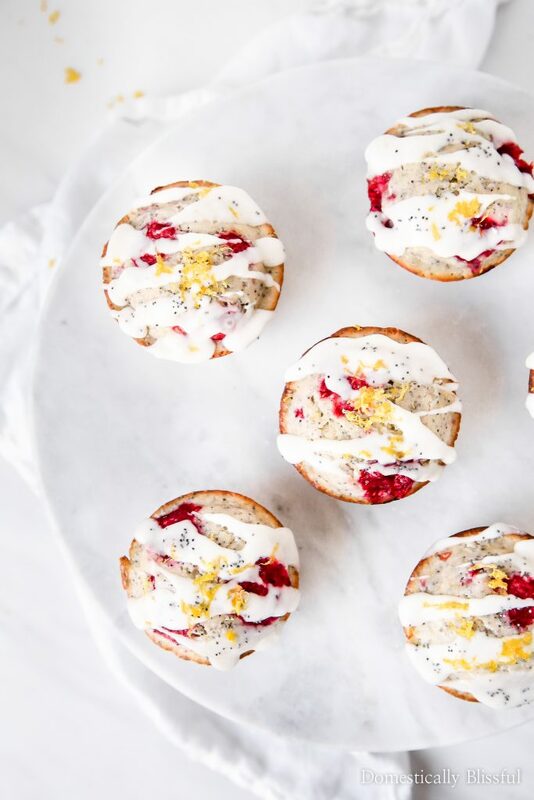 These Raspberry Lemon Poppy Seed Muffins are the perfect brunch recipe for spring & summer. Although I waited until March to share these breakfast muffins, I created this recipe in January & am currently sitting in our apartment in February putting this post together. And I wanted to share with you something I learned over the past few months while baking with only a small fraction of my normal baking equipment. Most of my kitchen supplies are in storage until we move into our new house, so I’ve been borrowing cooking/baking equipment from family as I needed them for recipes. While basic logic is that darker pans need to cook at lower temperatures for less time than lighter pans, I was still caught off guard the few times I made muffins these last 4 months while living without my normal muffin pans (my normal muffin pans are similar to these). So if you are wondering why the sides of these muffins are darker than usual, that’s simply because my brain hiccuped & I completely forgot that I was using darker muffins pans. 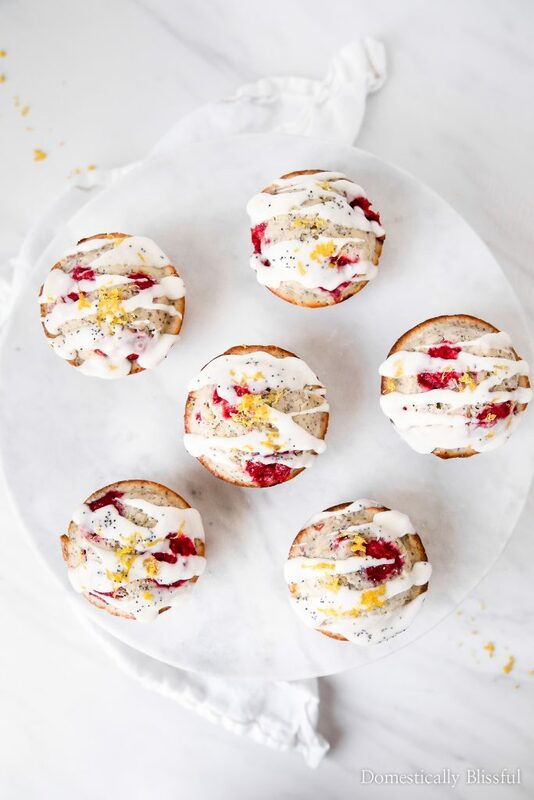 But regardless of the slightly more golden muffin edges, these Raspberry Lemon Poppyseed Muffins are the perfect way to transition from winter to spring & then right into summer. 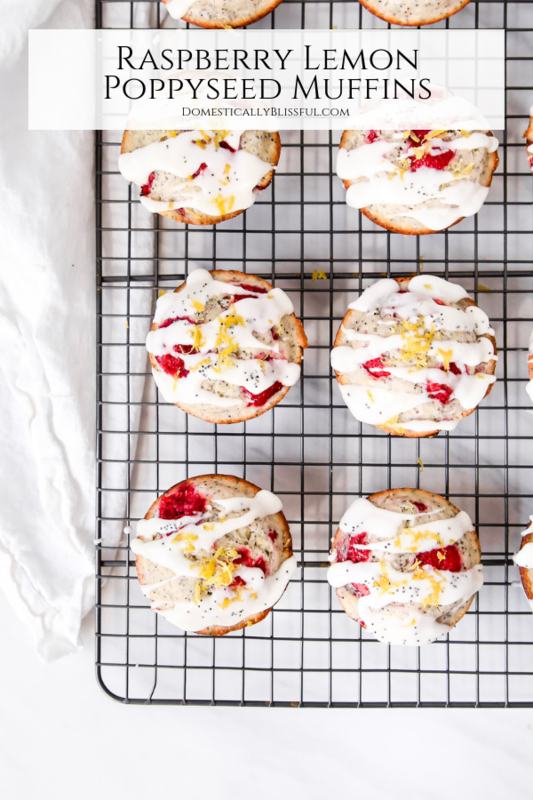 And if you love lemons & poppyseeds be sure to check back in 2 weeks, because I’ll be sharing a new recipe for Lemon Lavender Poppy Seed Cookies on April 1 (& that’s no April Fools joke!). 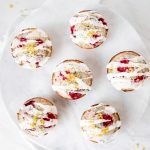 But before we get to a new summer cookie recipe I hope you get a chance to bake up these delicious lemon berry muffins! 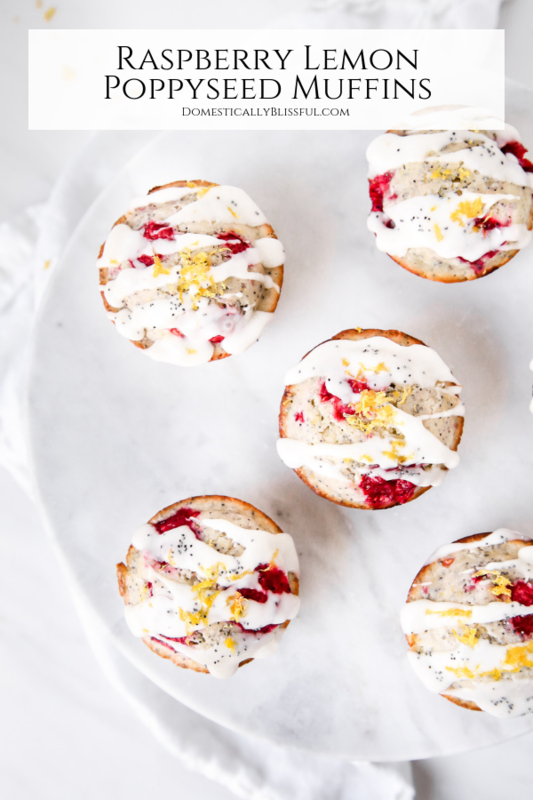 These Raspberry Lemon Poppyseed Muffins are the perfect brunch recipe for spring & summer. In a large bowl, combine the sugar & lemon zest & rub them together with your fingers for about 30 seconds to infuse the sugar with lemon flavor. In a separate bowl whisk 1 cup milk, 2 large eggs, 8 tablespoons cooled melted butter, 2 tablespoons lemon juice, & 1 teaspoon pure vanilla extract. Create a funnel in the dry ingredients & pour the liquid mixture into the center. Gently fold in the 1 cup raspberries until evenly dispersed. 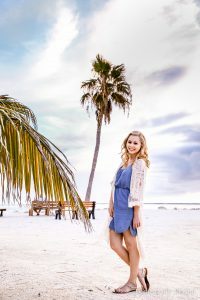 While the muffins are baking whisk the 1 cup powdered sugar, 1/2 teaspoon vanilla extract, 1 tablespoon lemon juice, & 1 tablespoon whole milk in a small bowl. Set to the side. Let your muffins cool on a wire rack. If you are using a darker muffin pan be sure to lower your baking temperature (to about 375 degrees Fahrenheit) & adjust the baking time (mine only took about 15 minutes to bake in a dark pan). Also, to ensure your oven is at the right temperature for baking, preheat your oven before you start so that it will continue to warm up an additional 5-10 minutes before you place your muffins in the oven. Make sure not to scoop right from the container, this will compact the flour & be too much. Scoop with a spoon into your measuring container for more accurate measuring. Don’t over mix. Some lumps are normal. To make it look pretty I press a few extra raspberries in the top of each muffin before baking. When a toothpick comes out clean your muffins are done baking. Store your muffins in a sealed container for up to a week. 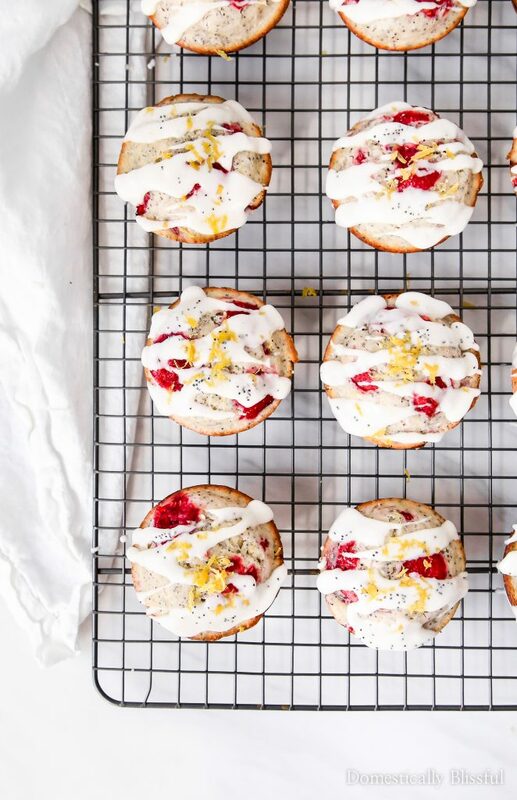 If you make these Raspberry Lemon Poppy Seed Muffins be sure to share a picture & tag @DomesticallyBlissful on Instagram so that we can all see your beautiful breakfast! 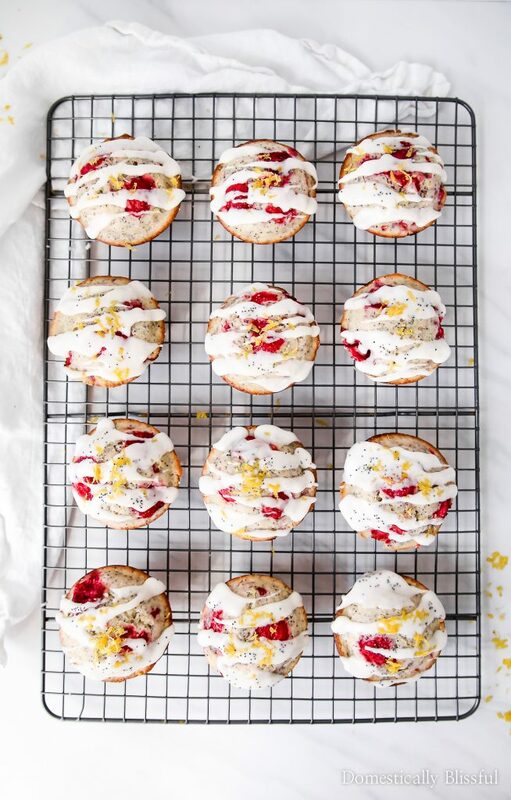 What is your favorite thing about this recipe, the lemon, raspberries, or poppy seeds?